One of the most important symbols of the Calgary Children’s Choir is the iconic kilt worn as part of our dress uniform. Our kilt is made from an authentic Scottish pattern called a tartan. The specific pattern we use is called the Thom(p)son Grey tartan, and it was registered with the Scottish Tartans Authority in 1958 by Lord Thompson of Fleet. Tartans (as opposed to checks) have three hues, and are registered to a particular clan, or family. 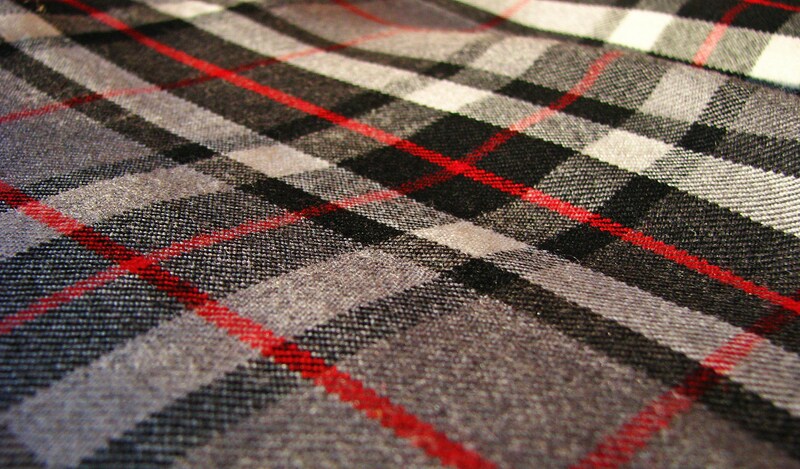 Thus, the Thom(p)son Grey Tartan, is associated with the Thom(p)son family, and it is just one of a number of different tartans associated with the Thom(p)son clan, all of which can be seen here. The Calgary Children’s Choir adopted the Thom(p)son Grey tartan for our dress uniforms in 1997. Our artistic director, Marni Strome, wanted to use a kilt that incorporated the red, white, and black choir colours that had already been established at the time. The board president, Pat Fahie, found the Thom(p)son Grey tartan and the choir has been using it ever since! Material for our kilts is ordered from Scotland through Halpern’s, a company that specializes in making school uniforms. Halpern’s then makes the choir kilts from this material. Each one of the Calgary Children’s Choir kilts have to be custom made, because the pleats of our kilts are only one inch wide. Most school uniforms have much wider pleats. The cost of a single kilt custom made for the Calgary Children’s Choir costs $300.00! Did you learn something new about the Calgary Children’s Choir kilt? Tell us in the comments below!